"Her father Henry wanted Mary to swear an oath recognising him as Head of the Church in England and admitting that his marriage to Mary's mother, Katharine, had been invalid. What would you have advised her to do?" Melita Thomas is the co-founder and editor of Tudor Times, a repository of information about Tudors and Stewarts in the period 1485-1625. Melita has loved history since being mesmerised by the BBC productions of ‘The Six Wives of Henry VIII’ and ‘Elizabeth R’, when she was a little girl. After that, she read everything she could get her hands on about this most fascinating of dynasties. 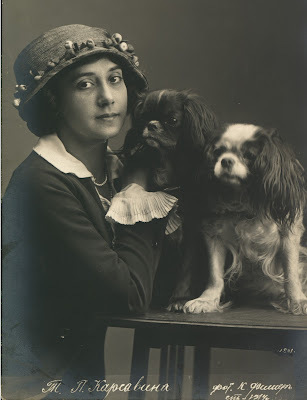 Captivated by the story of the Lady Mary galloping to Framlingham to set up her standard and fight for her rights, Melita began her first book about the queen when she was 9. The manuscript is probably still in the attic! Whilst still pursuing a career in business, Melita took a course on writing biography, which led her and her business partner, Deborah Roil, to the idea for Tudor Times, and gave her the inspiration to begin writing about Mary again. The King’s Pearl: Henry VIII and his daughter Mary is her first book. In her spare time, Melita enjoys long distance walking. She is attempting to walk around the whole coast of Britain, and you can follow her progress here. Welcome Melita! Your book is a great read. Mary and the influence of Isabella of Castile. It is a truism that women could not (or should not) rule in Europe during the middle-ages and Renaissance period, but the theory and the lived reality were two very different things. The second half of the fifteenth century, and the sixteenth century was an age of female rulers. Generally, female rule was not absolute – they were regents, governors, dowagers and queens-mother, whose effective dominance was hidden behind the cloak of acting on behalf of fathers, brothers or under-age sons – but one woman, Isabella, sovereign Queen of Castile, probably wielded more power and influence across Europe than any woman until the empresses of the eighteenth century. As a young woman of seventeen, Isabella was willing to wage war against her half-brother to have her claim to succeed him recognised, and on his death, when she was twenty-three, she raised troops and led an armed force to seize the throne, not waiting for her husband to take the initiative on her behalf. Isabella’s driving personality, and the mutually beneficial partnership that she and her husband, Ferdinand, King of Aragon, established, led to the emergence of Spain as one of the great powers of Europe, and the dominant force in the European colonisation of the New World. Isabella’s vision of herself was as a Crusader. Whilst crusading in the Holy Land was something that most European rulers talked about, but failed to do, Ferdinand and Isabella saw themselves on the front line – their duty was to reclaim Christian Spain from the remaining Moorish kingdoms, and to ensure purity of religion at home by rooting out heresy, and Judaism. Isabella had four daughters, two became queens-consort of Portugal, one succeeded her (much less successfully) as Queen of Castile, and the youngest, Katharine, became queen-consort of England. Katharine left her homeland at the age of fifteen, but records of her childhood, and her surviving correspondence, suggest that she was emotionally close to her mother. Isabella, in an early example of a woman holding down a high-powered and demanding job, whilst maintaining her maternal role, took her children with her everywhere, even close to the front-line of battle, and was closely concerned in their education. It is no stretch of imagination to suppose that her youngest daughter imbibed from her mother the knowledge that a woman could be a powerful and effective monarch, even if she were married, and that her supreme duty was to God. This belief in a woman’s duty to be a crusader, to protect her faith, and to fight for her rights were amply illustrated by Katharine’s refusal to accept her husband, Henry VIII’s plan to set her aside, because they had only one daughter, and no male heir. That Katharine was seen as a fearsome opponent is illustrated by Henry’s concern that Katharine would raise an army against him and ‘wage war as fiercely as ever her mother had done’, and by her nephew, the Emperor Charles V, telling the English ambassador, only partly in jest, that his sole fear was that ‘(Katharine) would ally with French and defeat him’. This was the heritage of Katharine’s daughter, Mary. It was not the custom in the sixteenth century for royal children to live with their parents full time – Isabella had been exceptional in that regard - so Mary was housed separately, but she visited her parents for weeks and even months at a time and all the available evidence indicates that both of Mary’s parents were devoted to her. Naturally, of course, she would have been included in the daily activities of her mother, rather than her father and, whilst there is no evidence about what Katharine told Mary about her grandmother, it is not unreasonable to believe Mary heard the story of Isabella’s victories and the final surrender of the Kingdom of Granada to her, an event Katharine herself had witnessed in 1492. In 1525, Henry, despairing of a male heir, began to consider the possibility that Mary might succeed him. He sent her to the Marches of Wales to preside over the Council. Although not formally created Princess of Wales, she was called by the title, and very quickly accustomed herself to being treated as such, with the implication that the position held of being the king’s heir. The single extant letter from Katharine to Mary dating from this period, refers only to their mutual health, and the queen’s hopes that Mary will improve her Latin, and occasionally send copies of her Latin exercises for the queen to see. It says nothing about Mary’s role, or what the future might hold for her, but surely Katharine had told her about Isabella’s success, not just on the battle-field, but also in reinforcing crown authority, increasing trade and improving access to justice - thus creating a role-model for Mary. Eight years later, in 1533, Mary was informed that she was no longer to be termed Princess of Wales, nor to consider herself Henry’s heir. She was seventeen, the very age at which Isabella had insisted on her right to the Castilian throne, in preference to her half-brother’s daughter, whom most people thought was not his own child. The similarity of cases – the ‘true-born’ heir as Mary saw herself, versus the illegitimate (again in Mary’s view) Elizabeth, corresponds with that of Isabella and her supposed niece, Juana ‘La Beltraneja’, and it is impossible that Mary was unaware of the parallel. Isabella was not physically within the control of her half-brother, enabling her to take up arms to drive out La Beltraneja on her half-brother’s death, whilst Mary was isolated and powerless, stripped of even her household servants, but she continued to vehemently defend her position. Like Isabella, Mary had many supporters, and had Henry died without a legitimate son, Mary would undoubtedly have fought for the throne against any attempt to proclaim Elizabeth. As it was, Henry lived until 1547, and was succeeded by Mary’s half-brother. But on his death, in 1553, when an attempt was made to ignore her claim to the throne, Mary showed herself the true descendant of a warrior queen. Without hesitation, she called on her supporters and raised an army, preparing to fight to for her rights and her religion – just as Isabella had done. Late in her own reign, when there was war with France, Mary even talked of taking the field herself - surely, her courage, determination and martial spirit must have owed something to the example of Isabella. Lacock is a small village in Wiltshire, which many people will recognise, even if they’ve not been there, as a favourite place for filming, especially by the BBC. The village, with its timber-framed houses, has proved an ideal backdrop for scenes in “Cranford”, “Pride and Prejudice”, “Wolf Hall” and “Downton Abbey”, and for the film “Harry Potter and the Half-Blood Prince”. 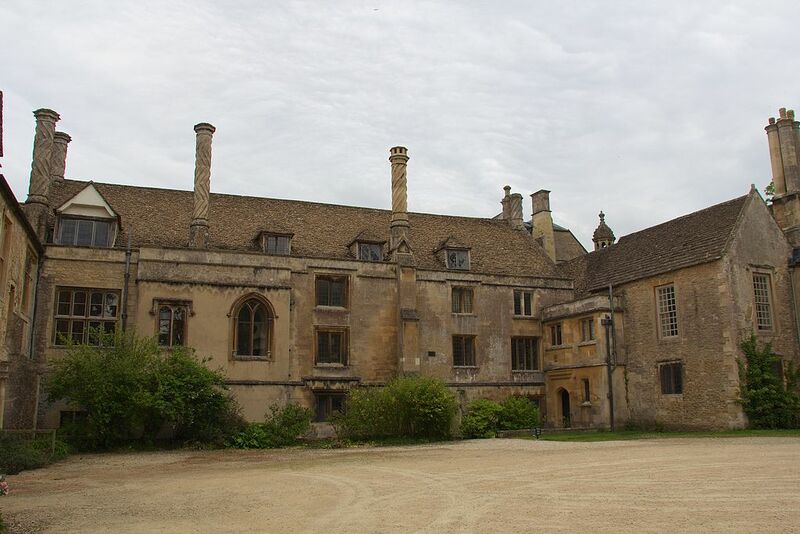 In 1232 Lacock Abbey was built, initially as a nunnery, but it subsequently became a comfortable family home, and the village grew up beside it. One of the Abbey’s most famous residents was William Henry Fox Talbot, who created the first ever photograph negative there in the nineteenth century and established Lacock as the birthplace of photography. The Fox Talbot Museum contains changing exhibitions of the history of photography. Because Lacock is so frequently used for filming of historical series, there are no double yellow lines in the village (though there are plenty of notices warning you not to park on the street!) and television aerials are kept to a minimum, even though nowadays they can be photoshopped out. The whole village belongs to the National Trust, so that it retains its special character. It is a wonderful place to visit, and I feel very lucky to live nearby. Just walking round the village gives the feeling of having stepped back in time. 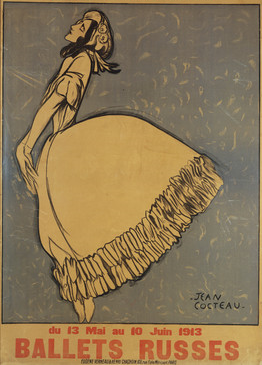 choerographed by Fokine, costume by Bakst, in Paris 1913. Continuing the story of the British diplomat Henry James Bruce and Russian prima ballerina Tamara Karsavina, who fell in love in St Petersburg in 1913. Eight months after they had witnessed the October Revolution in 1917, Lenin declared Britain an enemy of the Bolshevik government. Henry’s British Embassy colleagues fled from Moscow to Britain via the Crimea. 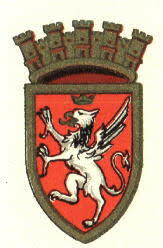 But Henry went in the opposite direction, north to Petrograd, to rescue his lover and their 19 month old son, Nikita. Read Part One of their adventure here. Petrograd had been Tamara’s home all her life, but now she agreed with Henry that it was time they left. Although she had no political objections to the new order, communal life was stressful. The apartment in Millionaya Street, where she lived with Nikita and their cook, nanny and maid, was now shared with five families. Life was chaotic, with children playing in the shared passage, its ceiling criss-crossed with washing lines. Tamara’s cook Liza had been elected onto the house soviet committee but nobody knew who owned the house or to whom they should pay rent? Tamara had been with handsome, clever Henry for five years but now that Lenin had made peace with Germany, her dull husband, Vasilii Moukine, might return from fighting. He had agreed to divorce Tamara but the Bolsheviks had abolished both marriage and divorce. The chaos extended far beyond Millionaya Street. When Moscow became the capital in March 1918, Petrograd, formerly St Petersburg, was of little national or international importance and was now bankrupt. The canals, once busy with barges bringing food and fuel, were collapsing and choked with rubbish and sewage. Cholera and typhus had already killed several thousand people that winter. Although the population had halved, there was not nearly enough food. Most of the cab-horses had starved to death, and the electric trams no longer ran. Henry was compelled to walk to the former British Embassy where he found Captain Cromie, the Naval Attaché, the only British diplomat left. Cromie showed him coded telegrams which revealed that all routes south to the Crimea, east to Japan and west to Finland and the Baltic Sea were closed. Their only way out of Petrograd was north via Murmansk in the Arctic Circle, where British troops were stationed to reinforce the White Army. Grand Season of Russian Ballet at Theatre Royal Drury Lane, June 1912. However, they couldn’t tell where the front line of the civil war between the White and Red armies was located, only that it was getting closer every day. 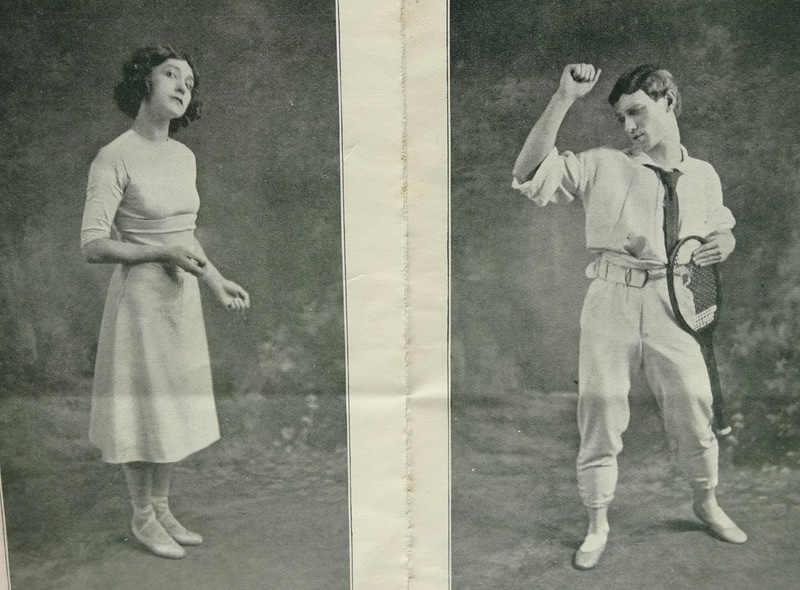 As a foreigner, Henry needed a permit from the Foreign Ministry in Moscow to travel; and even Tamara needed permission from the workers’ soviet that now controlled the Marinsky Ballet. Another problem was that Tamara’s face was even better known than the Czarina’s or Lenin’s. For 15 years she had appeared to two thousand people at each performance in the Marinsky Theatre and she had toured all over Russia and Western Europe with Diaghlev's Ballet Russe. Postcards were sold of her posing as Giselle and Salome; and with Nikita on her lap. His thick curly hair and his mother's large dark eyes were unmistakable. If a reward was posted for their capture, they might easily be denounced to the authorities in exchange for a meal or a few logs of firewood. as Zobeide on Sheherazade by John Sargent, 1913. After a tense week of enquiries, an unidentified woman telephoned the apartment. She had passes for a steam-ship departing the following morning. It would take them along the River Neva and through Lakes Ladoga and Onega north to Petrozavodsk, which was beyond the front line on the railway to Murmansk. Tamara packed two trunks, which was the most they risked taking without arousing suspicion. She found it a nightmare choosing what to include and after a desperate search failed to find the key to her bureau containing her personal letters and photos. They waited until three in the morning when it was dark enough not to be seen. Liza the cook and Katiousha her maid put aside their new revolutionary status and marked an ancient custom. They all sat in a circle in silence, then crossed themselves and quietly said goodbye. Tamara’s neighbour Prince Dolgorukov accompanied them to the pier on the Neva embankment. Henry spoke fluent Russian, French and German, and both he and Tamara had travelled all over Europe. But neither of them had travelled incognito, with a child, through enemy country before. Portrait of Tamara Karsavina by Henry J. Bruce, 1918. The steamship was crowded with families anxious to return to their homes around the inland lakes before they were cut off by civil war. There were also young men eager to join the fighting – wherever the front line was now. A young Count told them that he planned to join the White Army, though it already had a surplus of officers and not enough soldiers. The Red Army had the opposite problem – too many private soldiers, who decided military strategy by vote. After five days the boat arrived in Petrodovask on the west coast of Lake Onega, where they planned to catch the steam-train north. Henry and the Count disembarked cautiously. The road leading up from the empty harbour to the railway station was shrouded in drifts of willow seed, stained with blood. 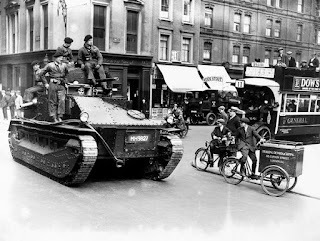 A French officer told them that the streets were overlooked by snipers and the trains were full of Red Army soldiers, whose few officers could not control them. He advised them to return to Petrograd, even though the situation there had deteriorated even further. Count Mirbach, the German ambassador, had been assassinated in Moscow and Lenin had laid the blame on Britain. As a result, Captain Cromie had been killed defending the former British Embassy in Petrograd. They decided to remain on the boat which was heading to the north of the lake. The young Count went to search for food but was shot by a sniper within sight of the steamer. He managed to crawl back to the boat, his plans to join the White Army in ruins. Five days later their boat arrived in Povenetz, a village at the far north end of Lake Onega. There they were told of a disused post-road leading north-east for about 200 miles to the White Sea, and they hired a horse and cart. Tamara was forced to reduce their luggage to a few pictures, some blankets and a teaspoon which had belonged to the dancer Taglioni. She gave away most of Nikita’s clothes, and asked the captain to return their trunks to Petrograd. From Povenetz, they travelled slowly through the forest, crossing marshes and rounding lakes. Mosquitoes rose in huge clouds and swarmed around their heads. For several days they saw only the occasional peasant, shrouded in muslin, working in an isolated clearing. At night, they shared the floor of rough window-less huts, lit by rushes. They drank weak tea, and ate hard sausage. The local people were friendly, but knew nothing of politics or the movements of the Red Army. Twenty years of dieting and dancing with bleeding feet, had taught Tamara to ignore both hunger and pain, while Henry had been toughened up by British boarding school. Nikita, a pampered city child, clung to his mother and screamed. After six days and nights in the forest, they arrived at a slightly more prosperous village on the edge of Lake Sumo. They had just let the horses go for the night when they learned that the village had a soviet committee. Without realising it, they had crossed the line into Red Army territory. Worse still, a consignment of vodka had just arrived. In an effort to improve productivity in both factories and farms, the Tsar had passed a law, which the Bolsheviks had upheld, against distilling vodka. But with the increasing anarchy, it had been impossible to enforce. After a short, fitful sleep in a hut, the leader of the soviet, Commissar Solkov woke them and announced that rather than let them continue round Lake Sumo by cart, his men, who were all drunk, would row them across. He obviously didn’t trust this well-dressed man with a strange accent, his beautiful wife with soft hands, and their child who wore shoes. If they did not agree, then he would lock them up in a barn. Henry remained outwardly calm, guessing that the commissar would almost certainly set the barn on fire. Postcards of Tamara Karsavina were on sale in Russia. Here she is with Louloushka, her King Charles Spaniel. Tamara pointed out that a storm was brewing, the lake was already rough and Nikita could not swim, whereupon he said, “It matters not if the little cur drowns.” At this Tamara was enraged and flew at him, screaming. She could cope with the new social order, but not with insults to her son. Henry thought it was all over. Despite their luck and fortitude so far, their escape seemed to be ending in disaster. Will they get away? Find out next month. I am trying to keep away from the computer at present to avoid this most obnoxious, recent invasion to Europe, "Black Friday". Instead, I have been out on the land, working in the sunshine harvesting our olives. 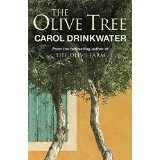 I know that I have written at length in my series of Olive Farm books, particularly the two travel books THE OLIVE ROUTE and THE OLIVE TREE about olive farming, its culture and its history. 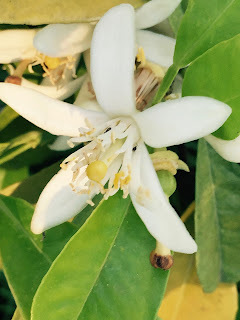 Still, every year when I return to the land to pick the fruits - a backbreaking task but one that I enjoy enormously - I am yet again enthused by the subject. I am reminded of how rewarding and historically rich this activity is and it fills me with a real sense of humility and I am grateful to Mother Nature for her gifts. We pick by hand, using no machines. We don't even beat the fruits to the netted earth because the sticks bruise the fruit's skin, causing it to split, the oil to weep and thus the fruit begins to oxidise. Oxidation augments the level of acid in the pressed olive oil. Olive oil that has an oleic acid level of higher than 0.8% cannot be sold as Extra Virgin. (Some territories allow the acid level to reach 1% before the oil loses it Extra Virgin label. In Europe, the regulations are more stringent). Once the oil has lost its Extra Virgin quality, it loses many of its natural vitamins and minerals and, most importantly, it lacks the antioxidants that make extra-virgin olive oil such a gift to our kitchens and our good health. These include protection again heart disease, lowering of cholesterol levels, protection against type II diabetes as well as several cancers. 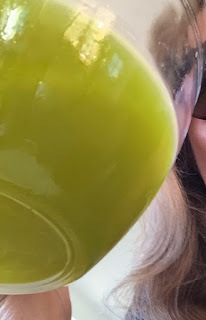 Recently-pressed unrefined olive oil has a greener or golden hue whereas refined olive oil will be lighter in colour and lack any residue of the flesh of pressed fruits. Because olive oil, unlike wine, does not have a long shelf life, it is important to consume it young. I think it is because we have stayed faithful to the time-honoured methods of farming that I find the harvesting and visits to the mill so rewarding and rejuvenating. I know that I am contributing to a ritual that is almost as ancient as farming itself. Of course, we press our olives at a modern mill. Today, it is very rare to find mills that press using the hemp mats (known as les scortins in French) stacked high and squeezed in a screw press. This process has been overtaken by more efficient and more hygienic systems. 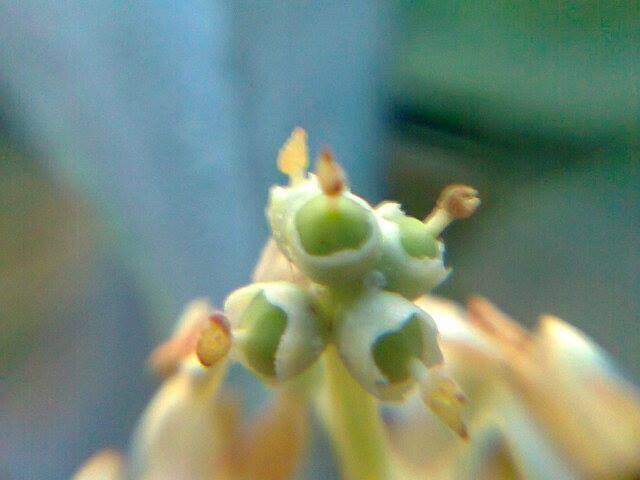 These photos show the old-fashioned screw press system at work. This method was, until the last century, used everywhere around the Mediterranean. Packing the hemp mat with olive paste. The paste is the result of crushing the the fruits including its stone with a gigantic revolving stone. As the screw presses its weight down onto the mats, the oil is squeezed out and runs into a steel plate. At this stage, as you can see, it is oil mixed with water. The liquids are then separated so what you are left with is pure olive oil. By the way, this ancient mill is still operating not far from where we live in the south of France. Here is a photograph of some of our olives being unloaded at the more modern mill we use, which is in Speracedes in the hills behind Cannes. As you can see we try to pick the fruits when they are green rather than dark purple or black. It gives a more peppery taste to the oil. Also, because we are organic, the sooner the fruits are off the trees the less chance the fly has to attack the drupes during her autumn breeding session. See how green and viscosy our oil is. Its extra virgin rating is between 0.5% and 0.6%. I spent seventeen months travelling solo around the Mediterranean in search of the history, secrets and cultures of the olive tree and its cultivation. I wanted to know where it all began. No one knows precisely who first picked a drupe from off an olive tree or wild bush, perhaps, back then, and decided to experiment with its oil. I found no definitive answers but I did manage to trace olive routes, olive developments from the fourth to fifth millennium BC forwards. I discovered two groves of 6,000 year old olive trees - each grove, boasting about a dozen remaining trees, still delivering their annual fruits and still being pressed into fine extra-virgin olive oil. el, Iraq were, as far as I have discovered, at the heart of the earliest olive farming operations. It's a tragedy that so many of the clues I found that date olive cultivation back to at least 5,000 BC have been destroyed in the recent wars. Here are one or two of my memories. Thankfully, saved. Libya. It's the women who harvest and prune the trees in north Africa. Leptis Magna, Libya. Libya was hugely important olive production region for the Romans. 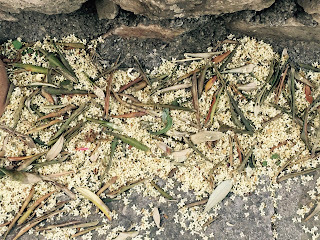 In our Olive Route films, we visit Testaccio in Rome which is a hill created from pottery shards, the broken remains of the amphorae used by the Romans to transport their oil and wine. These two photos were taken in Becheleah in Lebanon. These trees have been radiocarbon dated at over 6,000 years old. In the second photograph, I am standing with an Iranian friend, Soheila, in an olive tree where, over millennia, its centre has died off and hollowed out. It survives and thrives by producing new exterior shoots from its roots. These are the trunks that are encircling us. These two travel books were based on my experiences of those seventeen months travelling round the Mediterranean. The books, in turn, became the inspiration for a five-film, high-definition documentary television series narrated and written by me. 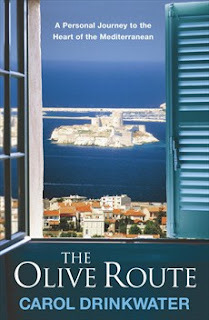 The films were shot round the Mediterranean although, due to the Arab Spring uprisings and the Syrian war we were not able to shoot everywhere I travelled when I was alone researching for the books. Last month I revisited Perugia, where I studied Italian in my teens. At lunchtime, when I finished my classes at the University for Foreigners, I used to make my way up the steep medieval streets to a mysterious place called the Rocca Paolina. This was an enigmatic, subterranean cavelike labyrinth on the edge of the city and I was usually alone there. It appealed to my adolescent love of solitude and the story attached to it fascinated me. (From Early Modern Italy - A Social History by Christopher Black). As always in Renaissance history, brutal crimes, religious sentiment and sensitivity to art co-existed, often in the same person; Perugia’s most famous artist, Pietro Vannucci (Perugino), taught Raphael. 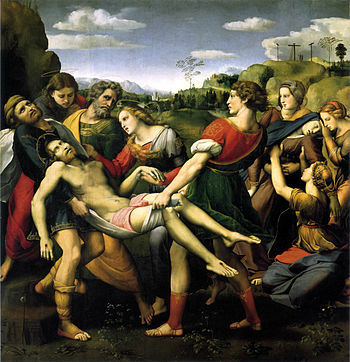 In memory of the tragic death of her son Grifonetto, Atalanta Baglioni commissioned Raphael to paint a Deposition where the characters of that terrible event were to be depicted. In his 1507 Entombment, now in the Galleria Borghese in Rome, Atalanta is portrayed as the heartbroken Madonna, Grifonetto is the one bearing the dead Christ and Zenobia, Grifonetto’s wife, is represented as Mary Magdalen. Gianpaolo Baglioni escaped the slaughter and ruled over Perugia for many years. In an age when Popes were formidable and violent politicians, Perugia’s arrogance and independence was considered intolerable. Gianpaolo was as ferocious as the rest of his family and the Popes were afraid of his ambition. So Leo X lured him to Rome, promising him safety; Gianpolo came, and was tortured and beheaded. 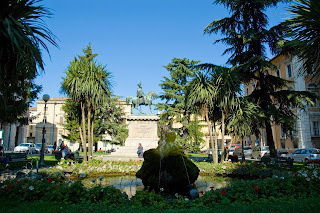 His sons and nephews continued to fight and murder one another and the Farnese Pope, Paul III, visited Perugia. All the nuns in the city had to queue up and kiss his feet. In 1538, when the Pope raised salt tax, Perugians revolted against this and were excommunicated. Paul III then sent an enormous army of mercenaries and Spaniards and handed over the city to the Preservers of Ecclesiastical Obedience. Paul 111 decided to humiliate and control the proud city of Perugia by building a massive fortress, the Rocca Paolina, as a symbol of his power. Over a hundred houses, as well as all the palaces and towers of the Baglioni, churches and monasteries were partially demolished and used as building materials for his fortress. Instead of destroying the houses entirely, the Pope’s architect, Sangallo, left the lower part of the houses and the streets to create the phantom underground galleries that are still so intriguing. In this nineteenth century painting of Perugia by Giuseppe Rossi you can see that the massive fortress loomed over the entire city. In 1859, during the Risorgimento, Perugia again rebelled against Pope Pius IX, who sent 2000 Swiss Guards ( wearing those cute uniforms you see in the Vatican). They looted the city and butchered people in the street. With the unification of Italy the following year the new king of Italy, Victor Emanuel 11, finally liberated the city from the Popes. 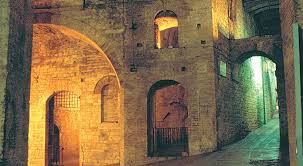 The fortress was torn down by the citizens of Perugia, using dynamite and their bare hands. Anthony Trollope, watching the demolition of the Rocca Paolina, wrote that ‘few buildings have been laden with a heavier amount of long-accumulated hatred’. The Prefecture Palace and the pleasant Carducci Gardens were built on top of of the Rocca Paolina, like a lid on Perugia’s gory and turbulent history. On a clear day in October we looked out over the balustrade at the end of the gardens to see the stunning golden landscape of Umbria, as far as Assisi. I knew that the ruins where I used to wander long ago had been cleaned up and that escalators had been installed to help people in this steepest of hill cities to reach different levels. Italian engineering never ceases to amaze me and in Perugia modern technology bridges different periods of history, as well as being extremely practical. I was afraid the Rocca Paolina would have lost its unique and melancholy atmosphere and was delighted to find an imaginative video installation down there. Without words, it uses Bach’s music and expresses time as waves, floating clouds and kaleidoscopic mosaics; a griffin, Perugia’s symbol, flies through the film, swooping through shattered buildings and brutal wars to some kind of triumph. Viewed in the underworld, projected onto an ancient wall through a medieval archway, it’s impressive. STEPPING FROM THE SHADOWS: Robert FitzHarding: minor character, major player by Elizabeth Chadwick. Writing works of fiction set in the medieval period across a broad canvas, I often have to research characters who might only have a few lines in my novel, but whose influence and impact on their world while they were alive, was considerably greater. They might dwell in the shadows now, but they were big players on the stage of their own lives. One such person is Robert FitzHarding of Bristol, a twelfth century merchant, landholder, broker and baron, who appears in my current work in progress The Irish Princess, as the man responsible for introducing interested parties and assisting them in their negotiations to obtain the right deal and support for their enterprises. When the Irish king of Leinster, Diarmait Macmurchada was exiled from his land, it was to Robert FitzHarding in Bristol that he brought his plight. The latter advised him to seek the aid of King Henry II and gave him letters of introduction. 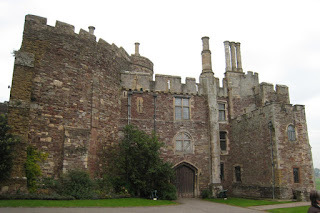 On Diarmait's return from Henry's court in Aquitaine, Robert housed him in comfort in Bristol at Henry's request and brokered an introduction to Richard de Clare, lord of Chepstow who would provide the military might that would eventually restore Diarmait to his position in Leinster and sweep the Cambro-Normans into Southern Ireland with history-changing consequences. Born around 1095, Robert FitzHarding's family background was aristocratic, but of the Anglo Saxon persuasion rather than Norman, although intermarriage had occurred in the years since 1066. English high status survivors are a rare breed, but Fitzharding was one of their number. He was the son of a royal official, Harding of Baldwin Street and his grandfather was an English thegn from Somerset called Eadnoth the Staller. The family, following the Norman Conquest held their land of the Earl of Gloucester for a single knight's fee (the amount of land thought to be sufficient to sustain a knight and his military requirements). Robert's brother Nicholas was the holder of this knight's fee. Robert himself was a tenant of housing and lands in Bristol, probably a family inheritance, but held, like the Somerset lands, of various top ranking lords of the land. Robert held land on the High Street in Bristol, in Broad Street, Wine Street, St Nicholas Street, by the river Frome, and between Small and Broad Street. 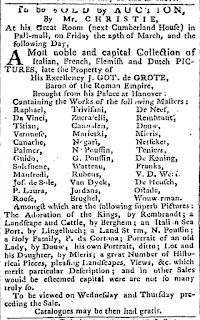 Added to this were two suburban estates held directly of the Earl of Gloucester. Throughout the mid 12th century, Robert FitzHarding continued to acquire land and knights' fees from various barons until he had his own lordship of scattered estates surrounding Bristol. Indeed, Richard de Clare, needing funds for his Irish expedition, sold FitzHarding one of his manors at Tickenham in Somerset. During the years of the Anarchy as King Stephen and the Empress Matilda fought for the throne, he supported the latter's cause - Bristol being the caput of Robert of Gloucester, half-brother to the Empress and her chief supporter. FitzHarding with his trading contacts and wealth was in a position to loan money, provide ships and wheel and deal to help further the Angevin cause. Certainly Henry II was so grateful to FitzHarding that when he came to the throne in 1154, he granted him the lands and estate of one Roger of Berkeley who was less wedded to the Angevin cause and had refused to pay dues from his lands. FitzHarding was given permission to build a castle on the land. The only stipulation was that his eldest son Maurice was to marry Roger of Berkeley's daughter and Roger of Berkeley's son also called Roger, was to marry Robert's daughter Helena. So, from wealthy burgess, Robert FitzHarding was now true landed gentry with a castle and dignity of his own. He had also founded the abbey of St Augustine's in Bristol between 1140 and 1148 (now Bristol Cathedral) and retired there shortly before his death in 1170. The family, while never rising to the highest ranks of baronial power, were nevertheless important at a regional level and formed the vertebrae in the backbone on which both the higher and lower echelons of society depended. Descendents of Robert FitzHarding still occupy Berkeley Castle today in unbroken tenure stretching for 900 years. A fascinating personality and I enjoyed discovering a little more about him, even if he only has a handful of pages in my novel. 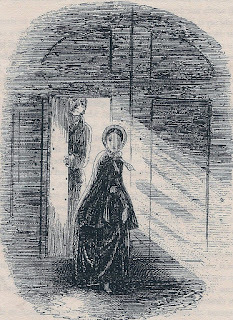 I'm listening to Little Dorrit as an audiobook at the moment, which will see me through quite a lot of cooking and baking. This is not a comprehensive set of remarks about the book, but two thoughts which I decided were suitable for this blog. 'I don't!' said she. Whereupon he once again tells her to count to five and twenty. Of course, in our age, we would think Tattycoram deserved some consideration and care, instead of being expected to be grateful for being taken on as a kind of semi-slave, a maid to a child older than herself, and, as she not unreasonably points out, a child she sees being indulged and adored while she is expected to fetch and carry. If this is supposed to compensate her for a life without a loving family, it's not very helpful. It does, incidentally, cast a slightly less benign light on the Coram orphanage than visitors to Coram Fields might be inclined to see it in. In Dickens's world view, it is, of course quite different. 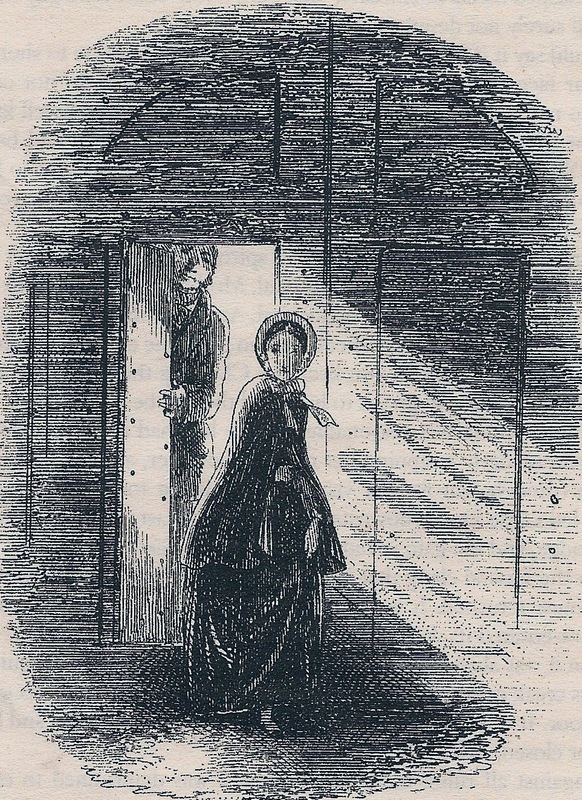 In the novel, Tattycoram sits diagonally across the narrative from good Little Dorrit, the Angel in the House, who lets her father, sister and brother treat her like a doormat, and who never complains. 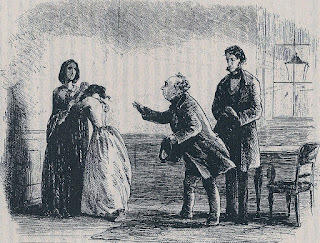 Compare Little Dorrit to Jane Eyre (whose outburst to Mrs Reed puts her more in the Tattycoram category, telling that heartless woman what she deserves, and hasn't got, as later she will tell Rochester). 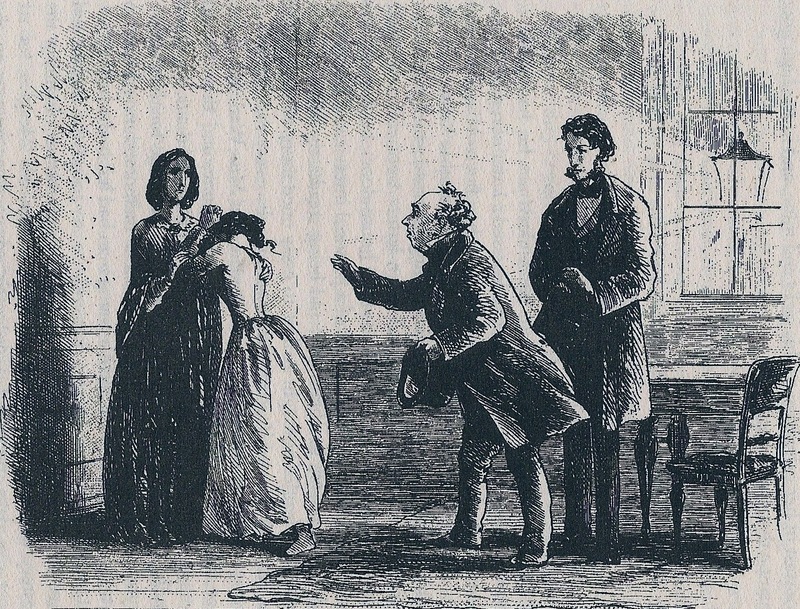 Dickens's women are, of course, notorious. However, Jane Eyre springs from the gentry; whether Bronte might have thought a working class woman was entitled to state her wrongs so vehemently is an interesting question. The second reflection is the dreary aptness and relevance of this passage, 160 years after the book was written. 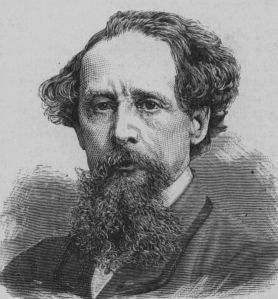 However much Dickens's caricatures of women annoy me, as well as being a magnificent writer and a great story-teller, he was often pretty perceptive about people. 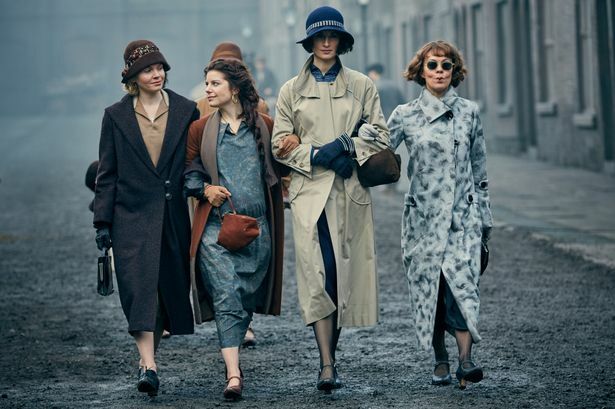 For those of us who like their televised historical fiction with a slag-heap of grit and a soundtrack that favours Nick Cave over luscious strings, this month's return of Peaky Blinders has been like Christmas come early. This recreation of 1920s Birmingham and the truly terrifying gangsters stalking its grimy streets blends fact with fiction: the Peaky Blinders gang existed but wasn't run by the Shelby brothers; Small Heath and the Garrison pub had strong associations with gangs and betting rings between the wars although the satanic-mill factories that form the backdrop were not in such consolidated ownership. Real characters are mixed in with the series' fictionalised family, including appearances by Winston Churchill and Billy Kimber, leader of the Birmingham Gang and vicious enough in real life to make Tommy Shelby seem almost a softy by comparison. Part of the series' appeal for me has always been its core of feisty female characters, centred on Helen McRory's Aunt Polly who ran the illicit gambling rings when the men were away being damaged by war. In series four, a new women has been added to the mix: Jessie Eden, a shop steward in one of Shelby's factories who we first encounter putting on her lipstick in the gents' toilet and responding to demands she go somewhere more suitable with the rather cracking: 'You don't have a woman's lavatory on the second floor because no women get this far up." 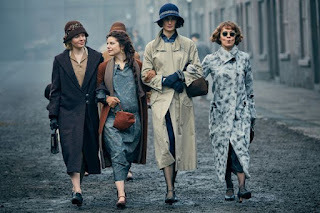 Publicity round the series suggests Eden has been brought in as a possible love interest for Cillian Murphy's character Tommy. Given the show's track record with its female characters, I think we can hope for something closer to the actual Jessie Eden, who is something of a Brummie, and certainly a trade union, hero. She was born in 1902 and, when we meet her challenging Tommie about female pay in 1925, was actually working at the Joseph Lucas Motor Components Factory where she was a shop-steward for the Transport and General Workers' Union. 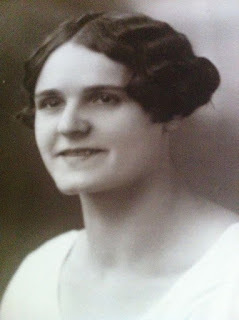 At the time of the General Strike in 1926, the percentage of unionised women at the factory was tiny and completely over-shadowed by the 10,000 non-unionised women, nevertheless Eden marched the women in her section out to join the strike. When she was interviewed by the Birmingham Post on the 50th anniversary of the Strike in 1976, Eden recalled the privations of the period: "We used to take our turns picketing or join the big meetings in the old Bull Ring, which was much larger then. Sacrifices had to be made. We had practically no meat during the strike. We lived on bread, jam and marge.” She also recalled her own brush with the law on the evening of the May Day march which saw a procession of 25,000 people, witnessed by another 100,000. "One policeman put his hands on my arm. They were telling me to go home, but the crowd howled, ‘Hey, leave her alone’ and then some men came and pushed the policemen away. They didn’t do anything after that. I think they could see that there would have been a riot. I was never frightened of the police or the troops because I had the people with me, you see. I don’t know what I’d have felt like on my own." Five years later, Eden really came into her own when she led 10,000 women out of the Lucas factory on a week long strike over new working practices which were driving female workers to the point of collapse. The irony of the story was that the new working speeds intended as a result of the American-designed systems were to be based on Jessie's work-rate as she was judged as an exemplar of efficiency. A further irony was that Eden, now a member of the Communist Party, was one of those who lost her job when a furious management imposed cutbacks. The 1931 strike is credited with starting mass unionisation among women workers but its aftermath was tough on Eden who apparently struggled to find work. She seems to then disappear for a period of two years but was actually in Moscow, rallying Soviet women construction workers employed building the city's metro. No mean feat for a working-class, apparently tiny, woman from Birmingham. Jessie Eden was a champion of social justice her whole life. She was a key figure in the 1939 Birmingham Rent Strike which brought 49,000 tenants out on strike, successfully winning them rent control in the council and private sector. She stood for the Communist Party in the 1945 General Election and led a march against the Vietnam War in Birmingham in 1969. Graham Stephenson, whose website is a fantastic resource for anyone interested in Eden and union/Communist politics, knew Eden in later life and described her in a recent Guardian interview: "People say that in her prime she was an electrifying speaker, who poured out words from the heart without notes and whose confidence in victory was contagious." That's a tribute I'm sure most of us would love to have and hopefully Peaky Blinders is set to give us a deeper flavour of this woman whose actions made such a difference to the women around her, women who she fought to see treated with dignity, equality and respect. Somehow the time for remembering her seems right. 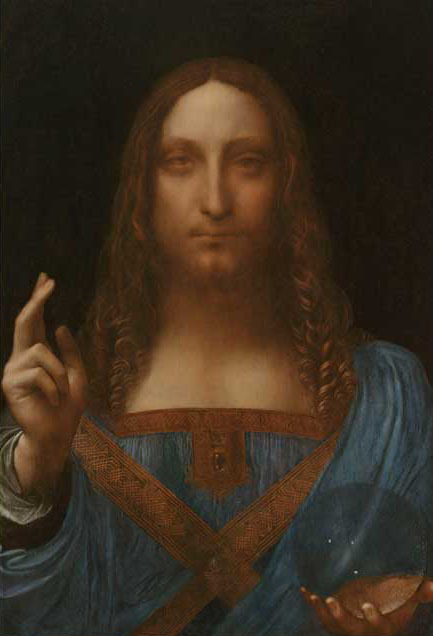 On 15th November 2017 Salvator Mundi, (very probably) by Leonardo Da Vinci sold at auction at Christie’s New York for $450.3 million. You may have read one of the reports about its rediscovery, restoration and controversial sale and resales - if not take a look at this article in the Guardian, it includes a nifty slider so you can see the effects of that restoration - you may also have picked up on the fact it was bought from an estate sale (pre-restoration) in 2005 for ten thousand dollars, and felt a deep twinge of sympathy for whoever sold it then. If that bothers you, my story today might break your heart. Robert Foulis (b.1707) and his brother Andrew were printers to the University of Glasgow and earned a reputation for the accuracy of their printing of Greek texts, and showed considerable critical and commercial sense in their choice of modern authors. 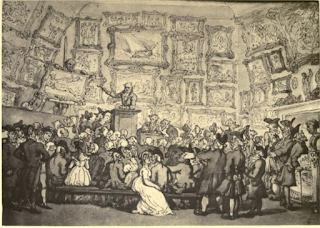 In the 1750s they set up an Academy of Fine Art in Glasgow, and made their art collection available to the students who studied there, a collection enhanced with further large purchases of art in 1772. The Academy however seemed to be a terrible financial strain and closed its doors after Andrew died in 1775. 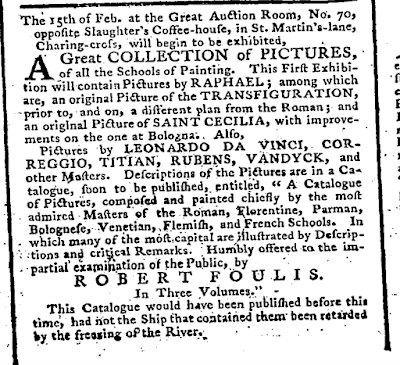 Early the following year Robert went to London, apparently to sell the pictures. He was advised against doing so by none other than Mr James Christie who apparently told him that the market was glutted with similar paintings. According to the snappily entitled Robert & Andrew Foulis and the Glasgow Press : with some account of the Glasgow Academy of the Fine Arts by David Murray, after expenses Foulis returned to Glasgow with just fifteen shillings of profit and died very shortly afterwards (2 June 1776). 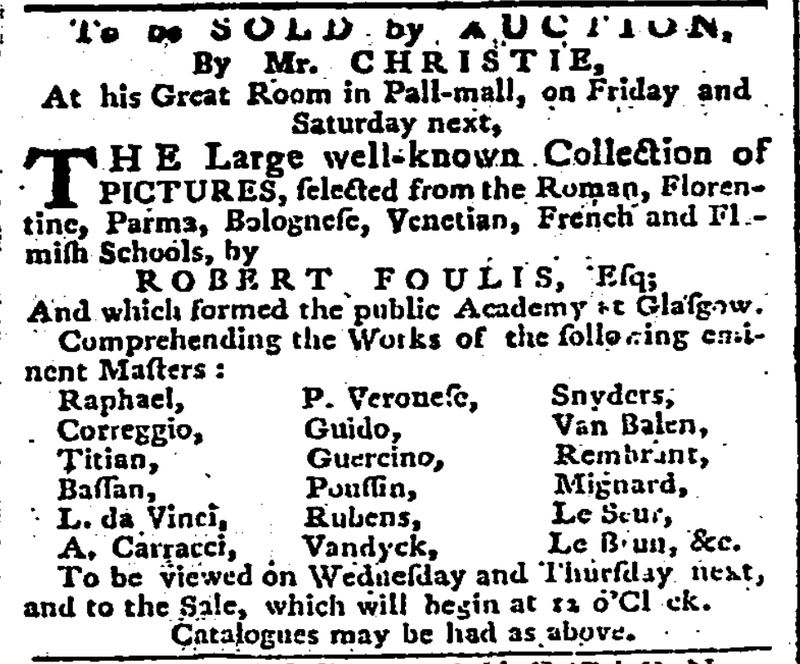 Now if Foulis had been trying to sell just one Da Vinci, that would put the pain of the person who sold Salvator Mundi in 2005 into some sort of perspective, but Foulis wasn’t just selling one painting, oh no. 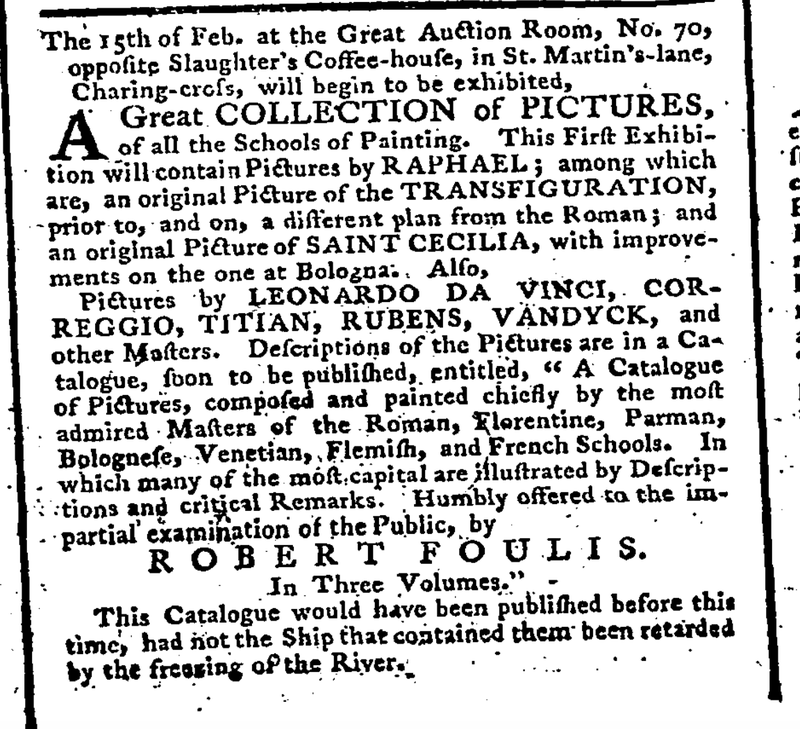 The collection he took to London included (according to his three volume catalogue) SIX works by Leonardo Da Vinci works, as well as numbers of works by Raphael, Titian and Rubens. Now it’s true he wasn’t the only one with a stack of Old Masters on hand in 1776. 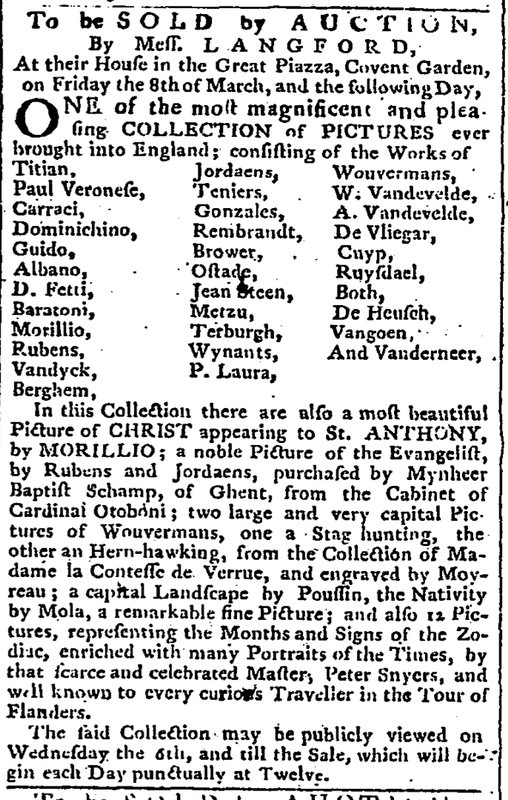 James Christie had in one sale sold pictures by all those artists the previous April, and did so again in March of 1776. 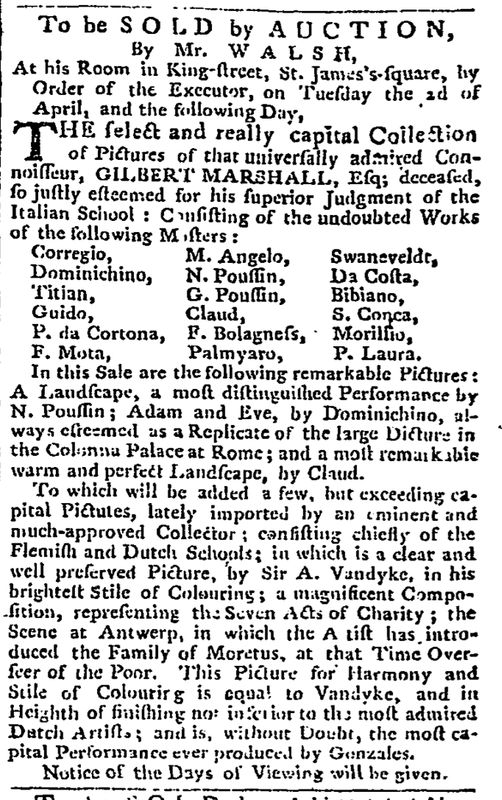 In the same issue of the Public Advertiser in which Christie advertised the 1776 sale, Messers Langford in Covent Garden are alerting readers to their own auction which includes Rubens, Rembrandt, Carracci and Titian and Mr Walsh has a selection of Poussin and Corregio up for auction if you aren’t Old Mastered out. But… As we all know only too well the closer you look into history the murkier it all gets. 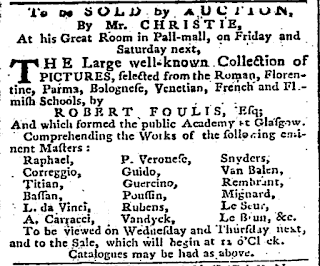 I’m pretty sure Foulis didn’t sell his pictures at all. Now, it may be that he intended to do so, and heeded Christie’s advice to wait, or it may be his original intention was to make money out of his collection in another way. 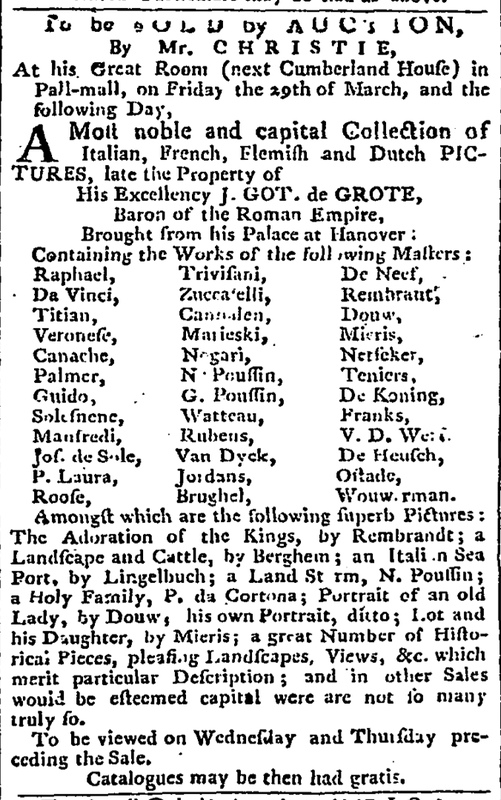 Here is the advertisement Foulis ran (with minor variations) from 31 January to 26 May 1776. There is no mention of any sale here. 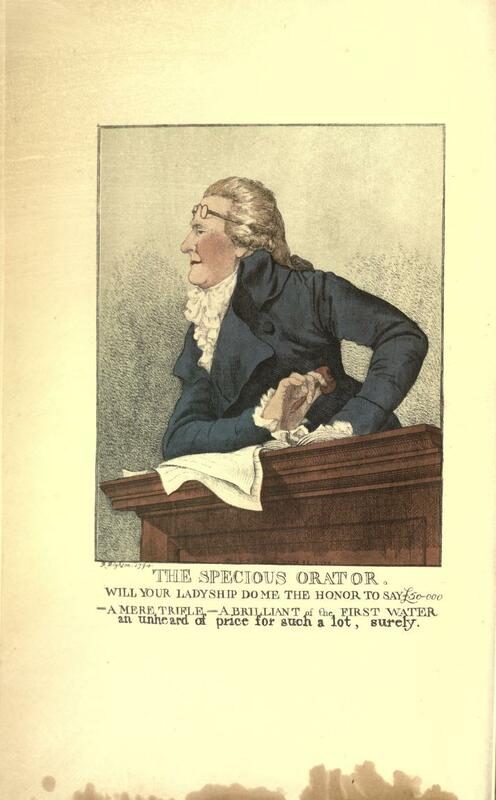 Instead he is quite explicitly exhibiting his pictures and charging a shilling a time, and also trying to sell his three volume catalogue of the collection. 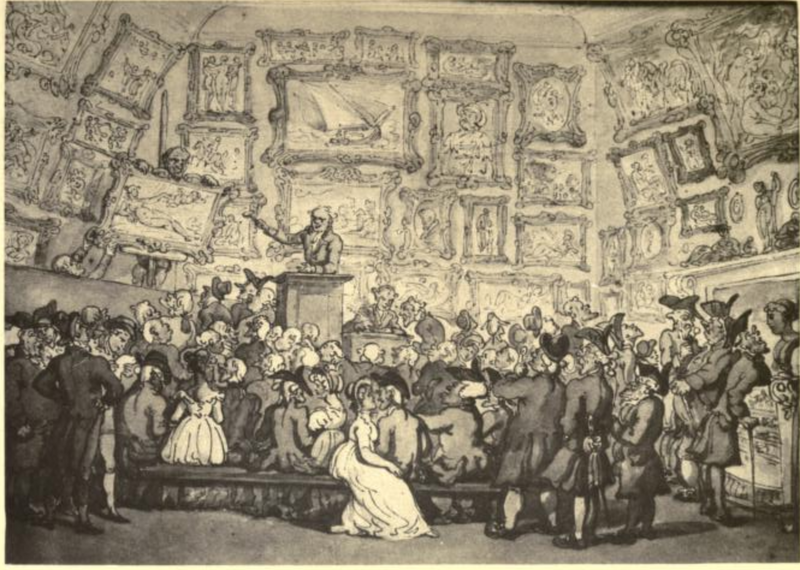 It’s true that auctioneers often exhibited works for a few days before a sale, but I can’t see any example where they did so for weeks. 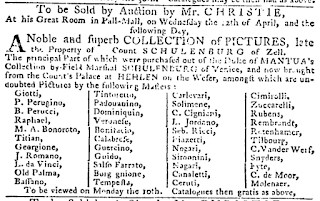 Langford charged people a shilling to come and see what he was selling from 1 March 1776, but he probably wouldn’t have had room to do so before then, giving he had two other old master sales in February. For anyone who has tried to tempt Londoners to an event, that fifteen shillings profit looks pretty reasonable now. There is no doubt that Foulis was devastated by the failure of his exhibition. His printer gives a rather harrowing description of him returning home to Glasgow, exhausted and deeply disappointed. So why were they sold at this point? The new season has begun, but it's only a couple of weeks old, so it's still early for the eighteenth century oligarchs to have gathered, I’d have thought. Possibly Robert’s death had made his family’s severe financial problems acute and they had to sell as quickly as they could. The sale realised £381 8s 6d. 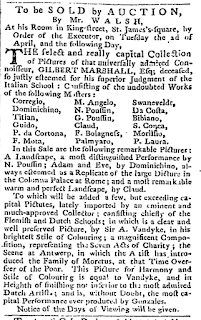 It’s tempting to insert a snarky remark about Christies having got a lot better at selling Da Vinci’s since then, but something else must have been going on too as Christie’s sale of M. Le Brun’s pictures in 1775 netted £2,142 and Sir George Colebroke’s collection sold for £4,385 17 shillings. Perhaps Christie knew the market was glutted, because he’d glutted it himself. It is also possible that Foulis’ paintings were being looked at with a sceptical eye. Given that there are under twenty paintings universally accepted as by Leonardo known today, it does seem a little dubious that so many drifted through the London art market at this time. 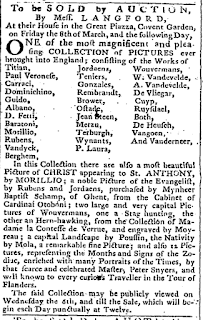 If anyone wants to take advantage of this link to the Foulis catalogue, and match his descriptions to a particular painting, I’d be fascinated to find learn more. I'd also love to know what happened to the pictures after the sale. Looking at various calculators of relative value, that £381 from the sale could be worth anything between forty thousand pounds and four million today. Even if we take the latter figure, that’s still a hundredth of what someone just paid for one rather beaten up Da Vinci. 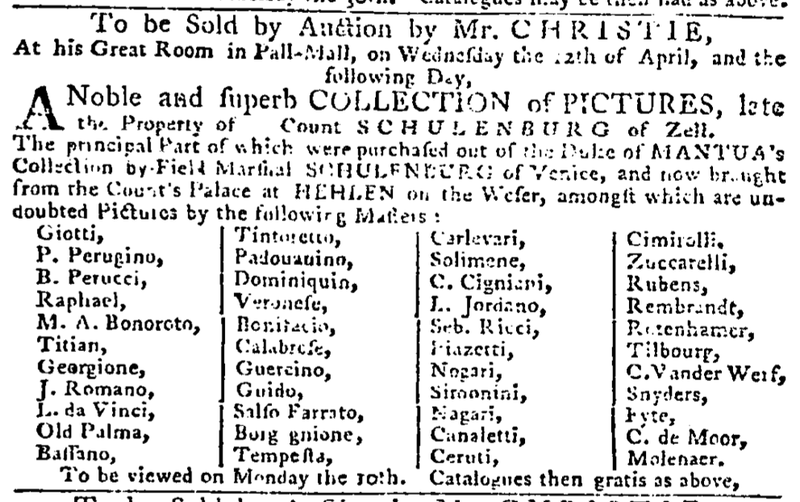 So next time you timeslip into the 18th century you know where to go for a bargain.